The gymnosperms, also known as Acrogymnospermae, are a group of seed-producing plants that includes conifers, cycads, Ginkgo, and gnetophytes. The term "gymnosperm" comes from the Greek composite word γυμνόσπερμος (γυμνός gymnos, "naked" and σπέρμα sperma, "seed"), meaning "naked seeds". The name is based on the unenclosed condition of their seeds (called ovules in their unfertilized state). The non-encased condition of their seeds stands in contrast to the seeds and ovules of flowering plants (angiosperms), which are enclosed within an ovary. Gymnosperm seeds develop either on the surface of scales or leaves, which are often modified to form cones, or solitary as in Yew, Torreya, Ginkgo. The gymnosperms and angiosperms together compose the spermatophytes or seed plants. The gymnosperms are divided into six phyla. Organisms that belong to the Cycadophyta, Ginkgophyta, Gnetophyta, and Pinophyta (also known as Coniferophyta) phyla are still in existence while those in the Pteridospermales and Cordaitales phyla are now extinct. 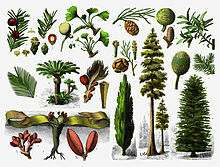 By far the largest group of living gymnosperms are the conifers (pines, cypresses, and relatives), followed by cycads, gnetophytes (Gnetum, Ephedra and Welwitschia), and Ginkgo biloba (a single living species). Roots in some genera have fungal association with roots in the form of mycorrhiza (Pinus), while in some others (Cycas) small specialised roots called coralloid roots are associated with nitrogen-fixing cyanobacteria. The current formal classification of the living gymnosperms is the "Acrogymnospermae", which form a monophyletic group within the spermatophytes. The wider "Gymnospermae" group includes extinct gymnosperms and is thought to be paraphyletic. The fossil record of gymnosperms includes many distinctive taxa that do not belong to the four modern groups, including seed-bearing trees that have a somewhat fern-like vegetative morphology (the so-called "seed ferns" or pteridosperms). When fossil gymnosperms such as these and the Bennettitales, glossopterids, and Caytonia are considered, it is clear that angiosperms are nested within a larger gymnospermae clade, although which group of gymnosperms is their closest relative remains unclear. The extant gymnosperms include 12 main families and 83 genera which contain more than 1000 known species. Family Zamiaceae: Dioon, Bowenia, Macrozamia, Lepidozamia, Encephalartos, Stangeria, Ceratozamia, Microcycas, Zamia. There are over 1000 living species of gymnosperm. It is widely accepted that the gymnosperms originated in the late Carboniferous period, replacing the lycopsid rainforests of the tropical region. This appears to have been the result of a whole genome duplication event around 319 million years ago. Early characteristics of seed plants were evident in fossil progymnosperms of the late Devonian period around 383 million years ago. It has been suggested that during the mid-Mesozoic era, pollination of some extinct groups of gymnosperms was by extinct species of scorpionflies that had specialized proboscis for feeding on pollination drops. The scorpionflies likely engaged in pollination mutualisms with gymnosperms, long before the similar and independent coevolution of nectar-feeding insects on angiosperms. Evidence has also been found that mid-Mesozoic gymnosperms were pollinated by Kalligrammatid lacewings, a now-extinct genus with members which (in an example of convergent evolution) resembled the modern butterflies that arose far later. Conifers are by far the most abundant extant group of gymnosperms with six to eight families, with a total of 65-70 genera and 600-630 species (696 accepted names). Conifers are woody plants and most are evergreens. The leaves of many conifers are long, thin and needle-like, other species, including most Cupressaceae and some Podocarpaceae, have flat, triangular scale-like leaves. Agathis in Araucariaceae and Nageia in Podocarpaceae have broad, flat strap-shaped leaves. Cycads are the next most abundant group of gymnosperms, with two or three families, 11 genera, and approximately 338 species. A majority of cycads are native to tropical climates and are most abundantly found in regions near the equator. The other extant groups are the 95-100 species of Gnetales and one species of Ginkgo. Gymnosperms have major economic uses. Pine, fir, spruce, and cedar are all examples of conifers that are used for lumber, paper production, and resin. Some other common uses for gymnosperms are soap, varnish, nail polish, food, gum, and perfumes. Gymnosperms, like all vascular plants, have a sporophyte-dominant life cycle, which means they spend most of their life cycle with diploid cells, while the gametophyte (gamete-bearing phase) is relatively short-lived. Two spore types, microspores and megaspores, are typically produced in pollen cones or ovulate cones, respectively. Gametophytes, as with all heterosporous plants, develop within the spore wall. Pollen grains (microgametophytes) mature from microspores, and ultimately produce sperm cells. Megagametophytes develop from megaspores and are retained within the ovule. Gymnosperms produce multiple archegonia, which produce the female gamete. During pollination, pollen grains are physically transferred between plants from the pollen cone to the ovule. Pollen is usually moved by wind or insects. Whole grains enter each ovule through a microscopic gap in the ovule coat (integument) called the micropyle. The pollen grains mature further inside the ovule and produce sperm cells. Two main modes of fertilization are found in gymnosperms. Cycads and Ginkgo have motile sperm that swim directly to the egg inside the ovule, whereas conifers and gnetophytes have sperm with no flagella that are moved along a pollen tube to the egg. After syngamy (joining of the sperm and egg cell), the zygote develops into an embryo (young sporophyte). More than one embryo is usually initiated in each gymnosperm seed. The mature seed comprises the embryo and the remains of the female gametophyte, which serves as a food supply, and the seed coat. The first published sequenced genome for any gymnosperm was the genome of Picea abies in 2013. ^ a b D., Cantino, Philip; A., Doyle, James; W., Graham, Sean; S., Judd, Walter; G., Olmstead, Richard; E., Soltis, Douglas; S., Soltis, Pamela; J., Donoghue, Michael. "Towards a phylogenetic nomenclature of Tracheophyta". www.ingentaconnect.com. Retrieved 2018-10-18. ^ a b c "Gymnosperms on The Plant List". Theplantlist.org. Retrieved 2013-07-24. ^ a b Raven, P.H. (2013). Biology of Plants. New York: W.H. Freeman and Co.
^ a b Christenhusz, M.J.M. ; Reveal, J.L. ; Farjon, A.; Gardner, M.F. ; Mill, R.R. ; Chase, M.W. (2011). "A new classification and linear sequence of extant gymnosperms" (PDF). Phytotaxa. 19: 55–70. doi:10.11646/phytotaxa.19.1.3. ^ Sahney, S.; Benton, M.J. & Falcon-Lang, H.J. (2010). "Rainforest collapse triggered Pennsylvanian tetrapod diversification in Euramerica" (PDF). Geology. 38 (12): 1079–1082. Bibcode:2010Geo....38.1079S. doi:10.1130/G31182.1. ^ Ollerton, J.; Coulthard, E. (2009). "Evolution of Animal Pollination". Science. 326 (5954): 808–809. Bibcode:2009Sci...326..808O. doi:10.1126/science.1181154. PMID 19892970. ^ Ren, D; Labandeira, CC; Santiago-Blay, JA; Rasnitsyn, A; et al. (2009). "A Probable Pollination Mode Before Angiosperms: Eurasian, Long-Proboscid Scorpionflies". Science. 326 (5954): 840–847. Bibcode:2009Sci...326..840R. doi:10.1126/science.1178338. PMC 2944650. PMID 19892981. ^ Labandeira, Conrad C.; Yang, Qiang; Santiago-Blay, Jorge A.; Hotton, Carol L.; Monteiro, Antónia; Wang, Yong-Jie; Goreva, Yulia; Shih, ChungKun; Siljeström, Sandra; Rose, Tim R.; Dilcher, David L.; Ren, Dong (2016). "The evolutionary convergence of mid-Mesozoic lacewings and Cenozoic butterflies". Proceedings of the Royal Society B: Biological Sciences. 283 (1824): 20152893. doi:10.1098/rspb.2015.2893. PMC 4760178. PMID 26842570. ^ Walters, Dirk R Walters Bonnie By (1996). Vascular plant taxonomy. Dubuque, Iowa: Kendall/Hunt Pub. Co. p. 124. ISBN 978-0-7872-2108-9. ^ Nystedt, B; Street, NR; Wetterbom, A; et al. (May 2013). "The Norway spruce genome sequence and conifer genome evolution". Nature. 497 (7451): 579–584. Bibcode:2013Natur.497..579N. doi:10.1038/nature12211. PMID 23698360. Wikimedia Commons has media related to Gymnosperms. Albert Seward (1911). "Gymnosperms" . Encyclopædia Britannica (11th ed. ).